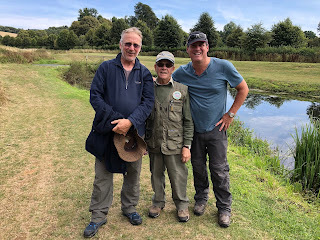 On the menu for the fish, sweetcorn, hemp, dead red maggots, 6mm and 8mm pellets together with some donated casters and micro pellets from my new best mate Neil (NS69) as I'd forgot to pack mine! Thanks mate! Pot full of corn and hemp in equal amounts on the 5metre pole line and straight out on the feeder. Feeder casts would be every two minutes to get some bait down and to try and bring the fish in with the noise of the feeder plopping in. Neil to my left started on his short line and was straight into a fish. 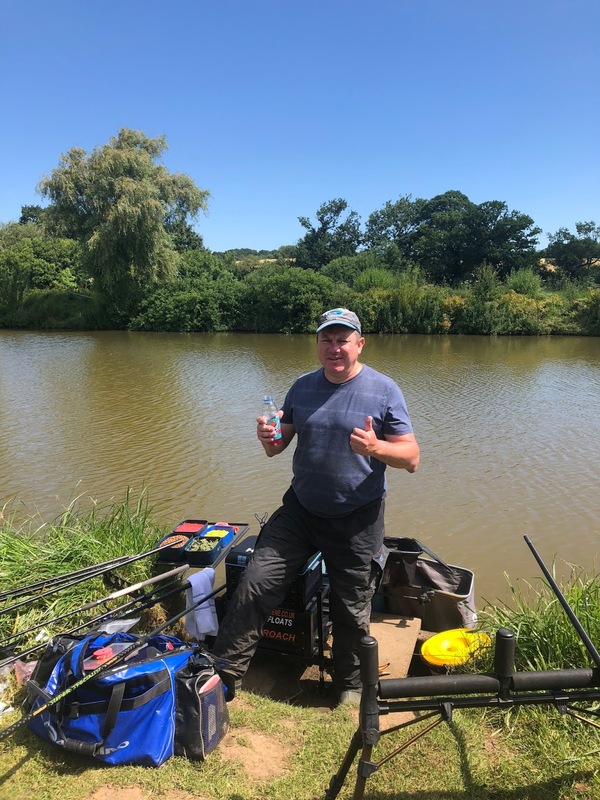 I stuck it out on the feeder line and after 20 minutes finally I was bringing in my first fish however Neil had netted four fish already! Had I made a mistake and started in the wrong area? I'd already fed that line so I had a quick look to see if I could get a fish, but nothing so I decided to stick with my plan of the feeder line. After the first hour I had 4 fish in the net but was trailing Neil by about 7 fish. Ruddy to my right was catching on his feeder line too with some very accurate casting indeed! The next hour past and I was still catching fish on the feeder line however I was behind both Neil and Ruddy. 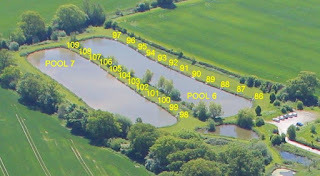 Now I was clipped up and casting nicely to the far bank however my next cast was to surprise poor Jay on Pool 7. Somehow the clip had come off and my feeder ended up dropping in Jay's margin giving him the fright of his life. The rig broke and so I had to retackle and re-clip up. It wouldn't be the last incident of the day either as the clip would come off later that day however I managed to stop that feeder before it went too far! My apologies Jay. 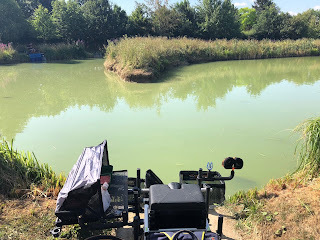 The weather was extremely hot and sunny with fish cruising around the peg and the feeder line bites had backed off somewhat so I decide to keep on the feeder line however with the pellet waggler. First cast and straight into a fish. Another fish 10 minutes later until they wised up despite pinging some 8mm pellets to try and bring them shallow. Neil and Ruddy had dropped of on the bites too with Neil trying the feeder line and getting snagged up before the feeder rod went up the bank for the rest of the match. Ruddy was priming and trying his margin line grabbing some cracking bream at the same time. I dropped onto the short line and primed my margin line with some pots of groundbait. Bites weren't instant and I was feeding heavily by hand. 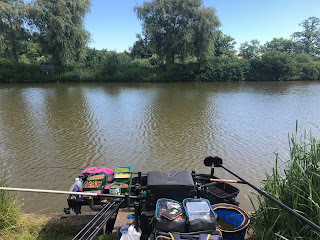 After another hour I put some more fish in the net but also foul hooked and lost a few however it was clear that I was way behind my two neighbours, could the margin be my saviour? The margin had been primed, triple corn on the hook going into the last hour of the match I needed to drag some big fish out to give myself a fighting chance. The final 30 minutes of the match and I started to connect with margin fish but they were not of the larger variety I was hoping for. The all-out was called and I felt quite disappointed with my efforts. The scales would tell me more later! 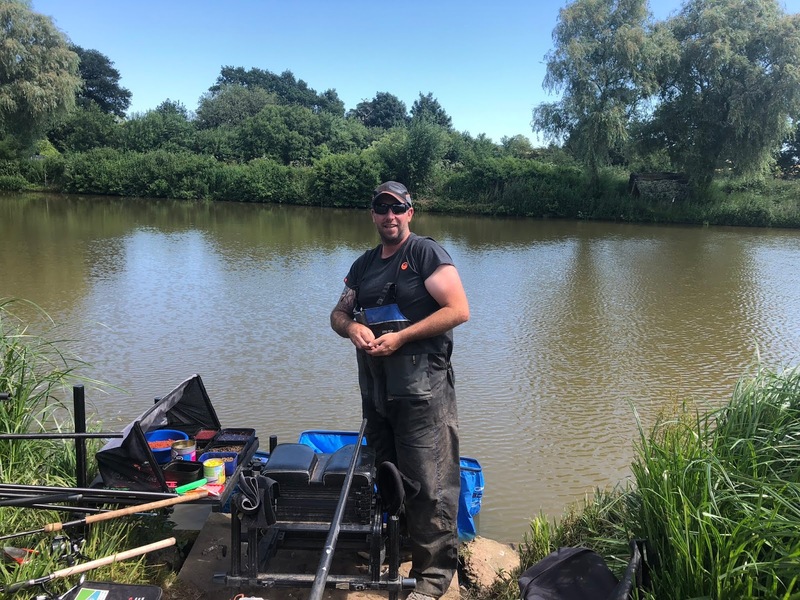 86lb 6oz for second last in section getting "chip shopped" by both Ruddy and Neil, also loosing a pound to Les H at the top of the lake whose "guessTweight" was 80lb and he weighed in over a 100lb! The feeder line didn't produce like I'd expected to. I simple could not get my 5 metre line working for me and maybe I didn't pile enough bait in to get the fish down on the bottom to avoid those would hooked fish. I must revisit my margin line strategy as it is simply not working for me. Tomorrow I'd try some new methods out. Peg 90 although some wayward casting ending up in Pool 7!